In the first installment of our two-part series on seacocks, we discuss the importance of accessibility and proper design and material selection, as well as the established industry guidelines that govern this vital component of cruising vessels. It’s a sight no boat owner ever imagines he or she will see, except perhaps in a bad dream: a 1-inch column of water spewing from a failed through-hull fitting and filling the cabin. If that fitting is located 3 feet below the waterline, it will allow approximately 34 gallons per minute, or 2,000 gallons an hour, into your hull—more than most bilge pumps or the proverbial scared crew member with a bucket can handle. Most bilge pumps are rated as if the pump is at the waterline and is operating at 13.8 volts, an unlikely scenario unless the engine or generator is running. Whether you’re kept awake at night by such visions or not, the possibility of a failed through-hull/seacock causing rapid down flooding is very real, and it exemplifies the need for secure, well-engineered, UL Marine-approved, properly installed fittings below the waterline. It’s also important to keep in mind that a “UL Marine-approved” label does not guarantee that the components have been properly installed or are appropriate for the application in which they’re being used. Section H-27 of the American Boat & Yacht Council’s Standards & Technical Information Reports for Small Craft states that “all piping, tubing, or hose lines penetrating the hull below the maximum heeled waterline, under all normal conditions of trim and heel, shall be equipped with a seacock to stop the admission of water in the event of failure of pipes, tubing, or hose.” (Note the use of the phrase “below the maximum heeled waterline”—I’ll talk more about this in a moment.) There are a few exceptions to this rule: cockpit drains that exit the hull above the resting waterline, as well as most engine/genset exhaust configurations. 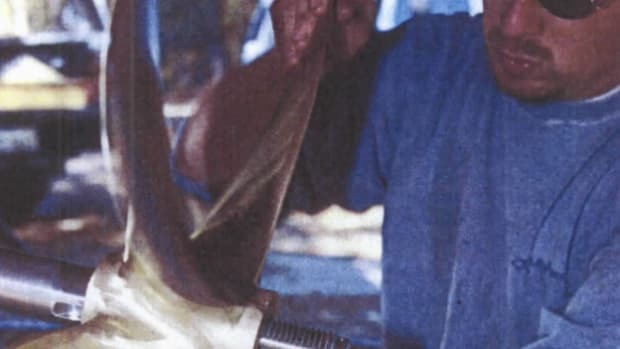 Another exception was added when the standard was revised in 2008: hull penetrations that discharge above the resting waterline and below the maximum heeled waterline and use reinforced piping or hose that resists kinking and collapse. This guideline as a whole is frequently ignored by boatbuilders, repair yards, and do-ityourself owners alike. If a through-hull is located above the resting waterline, most folks simply assume that no seacock is required. In truth, if a through-hull sits below the heeled waterline, a seacock is required, unless one of the exceptions comes into play. In order to comply with the above-recommended guidelines, it is important to clearly understand the phrase “maximum heeled waterline.” On a sailing vessel, this demarcation is defined as the level of the water on the hull when the hull is inclined to the level of the sheer amidships. Any hull penetrations that are wet under these circumstances are considered to be below the maximum heeled waterline. For power vessels, the guideline is somewhat more lenient, encompassing hull penetrations that would be submerged if the vessel were to heel up to 7 degrees. My personal comfort level typically dictates that seacocks be installed on penetrations that are less than 12 inches above the static waterline on power vessels. One would assume this is simply common sense, but alas, in the world of boat building and repair, it is not. When I point out this shortcoming to those in the industry, I often face resistance and the familiar “That’s the way we’ve always done it” refrain. Here’s the analogy I use in an attempt to drive the point home: If you were rotating the tires on your car and you lost a lug nut, would you force a nut whose threads were incompatible—coarse rather than fine, for instance—into the stud? How about if you were working on the brakes or steering components? Would you use fasteners whose threads were not alike? The answer, of course, is no, so why would anyone believe it’s OK to attach a tapered-thread NPT valve to a straight-thread NPS through-hull fitting? Why, indeed, yet it happens routinely. These ABYC strictures leave little doubt as to where seacocks are required. However, there’s more to a good seacock installation than simply complying with these recommendations. In order to be considered secure, reliable, and functional, seacocks must meet several material and installation parameters. Recently, a couple approached me with a question after I delivered a lecture on preparing boats for offshore passagemaking. “If you could give us one piece of equipment-related advice before we go cruising, what would it be?” they asked. My answer was simple: know where every seacock is aboard your vessel, make sure each one works and can be operated by any crew member, and be sure you can access all of them without the benefit of tools—and with your eyes closed. Sound extreme or unrealistic? Perhaps not, when you recall the flooding scenario related earlier. Thought should be given to this advice—words that I consider a requirement—when you task a boat yard or builder with selecting the location for a seacock and ensuring its accessibility. Will you be able to find and access the seacock quickly and easily? 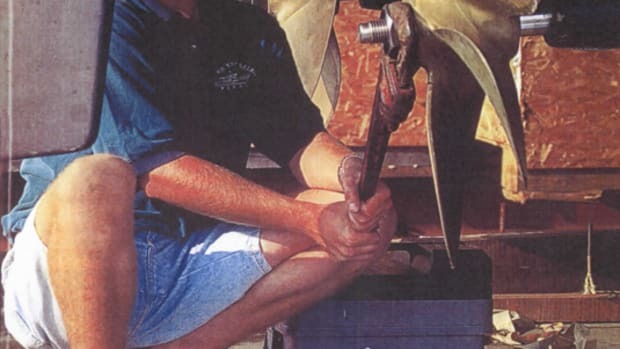 It is important that you become intimately familiar with the location of all hull penetrations on your boat. If you’re not sure where they all are, seek assistance from a boatyard tech or other knowledgeable pro during your next haulout. Make a chart or diagram that you can refer to later or even post somewhere aboard when cruising with guests who are not as familiar with the vessel as you are. If you are ever faced with flooding, chances are good the failed component may already be underwater, and thus finding it, or at least the seacock that will stem its flow, may be a “by feel alone” exercise. If batteries or critical components in the electrical system are submerged, you or your crew may also be doing this in the dark. A few years ago, a vessel I knew of nearly sank during a Caribbean passage because of a long-forgotten disconnected icebox drain that exited the hull above the resting waterline. During an extended passage, this hole was routinely thrust a foot or two underwater, and it admitted hundreds of gallons of water each hour. The bilge pump eventually failed (most likely clogged with washed-out bilge debris), flooding ensued, the batteries were submerged, unsecured sole panels floated out of position, and pandemonium reigned below. The crew was unaware of the disconnected drain, did not know its location, and therefore was unable to arrest the rising tide for several hours, nearly losing the vessel in the process. Just as important as knowing where seacocks are located is being able to easily and quickly access them without the benefit of tools. Burying a seacock in the bilge beneath a hatch that’s been screwed into place and has 300 lb. 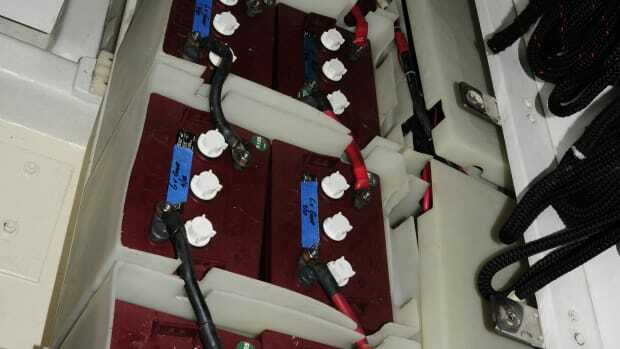 of house batteries sitting on top of it or under a V-berth shelf in a bilge that requires you to shimmy like a soldier under barbed wire to reach it should be avoided at all costs. I’ve encountered both scenarios during vessel inspections I’ve conducted. Seacocks should only be located in lockers or compartments that are easily opened without the aid of a socket wrench, screwdriver, or other tools. In the former case, access was improved by installing a hatch in the battery shelf, making actuation possible. In the latter case, remote tie-rod handles were manufactured and installed to facilitate the closing of the seacocks, which were difficult to see, much less reach. Even the most accessible seacock is of little use if it’s frozen or if it breaks when actuated because it’s constructed from an inappropriate material. Silicon bronze and leaded red brass are both materials that will serve well in seacock duty. The latter, sometimes referred to as 85-5-5-5 because of its composition of 85 percent copper, 5 percent zinc, 5 percent lead, and 5 percent silicon, should not be confused with ordinary brass, whose zinc content is much higher. 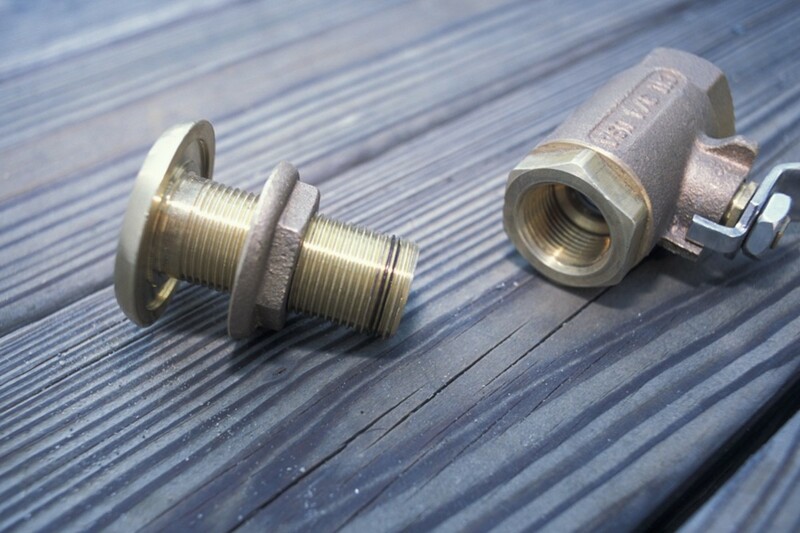 High-zinc-content alloys, such as ordinary brass, naval brass, and Tobin bronze, must never be used for seacocks or any raw-water or below-the-waterline plumbing. It is important to note that this admonition includes even the smallest seacock or raw-water strainer drain plugs, which are often inadvertently replaced with brass hardware, rather than bronze. Approved seacock composite materials include glass-reinforced, UV-inhibited nylon such as acetyl and polybutylene terephthalate. Marelon, manufactured by Forespar (www.forespar.com), is one example of an excellent nonmetallic, UL-approved below-the-waterline seacock assembly material. A note of caution: Be sure that your boat’s seacocks and through-hull fittings, whether metallic or composite, carry the UL approval number 1121 or 618C for “marine through-hull fittings and sea valves.” Where seacocks are concerned, not just any UL approval will do. Many valves carry UL approval for other uses, but only those that carry the “sea valve” approval are truly UL approved for this application. Unapproved seacock and through-hull fitting materials include the previously mentioned high-zinc-content brasses and stainless steel, the latter being susceptible to crevice corrosion when used in below-the-waterline applications. Additionally, chrome- or nickel-plated brass, which has a silver appearance and is often mistaken for stainless steel, suffers from the same failings as ordinary brass and thus must never be used in seacock, raw-water, or through-hull applications. Plastics such as PVC (regardless of “schedule”) and other non-reinforced, non-UV-inhibited, nonmetallic materials, while fine for domestic plumbing and non-overboard discharge sanitation plumbing, have no business being used in seacock and below-the-waterline raw-water applications. Until a decade or so ago, seacock design had remained unchanged for generations. The traditional cone-valve seacock served, and continues to serve, thousands of vessels admirably, although this type of seacock suffers from seizure problems if not regularly exercised and lubricated. If cone-style seacocks are seasonally maintained (disassembled, cleaned with solvent, lubricated, and lapped or sanded when necessary), they are exceptionally long-lived. I’ve seen 50-year-old examples that were operational and relatively leak free. More recently, the cone-style design has been supplanted by the ball-valve-style seacock, which has the advantage of being self-lubricating, thanks to hard, chrome-plated balls that ride on Teflon seats. Ball-valve seacocks are not as easily serviced or disassembled as tapered cone valves, but this shortcoming is offset by the fact that they rarely require attention. In order to gain the highly desirable UL and ABYC approvals, a seacock must possess a lever that arcs through 90 degrees of travel—no more and no less—to open and close the valve. This makes operation easy and quick and provides a clear indication, even from a distance, of whether the valve is open or closed. This prerequisite alone disqualifies the familiar gate valve from gaining approval. Gate valves, found on everything from washing machine supply lines to oil wells, utilize a round handle that usually requires several full revolutions to ensure that it is fully open or closed. Although this is less convenient and slower than a lever handle, it is the inability to determine at a glance whether a gate valve is open or closed that makes it inappropriate for use aboard seagoing vessels. Additionally, most gate valves are designed for domestic or industrial use and thus are not suited for the corrosive rigors of sea water. The materials used in many of these valves are galvanically incompatible, or they contain the dreaded zinc-laden brass valve stems. Also, the gates themselves may become fouled and eventually inoperable, thanks to barnacles, bivalves, and other hard marine growth. In short, gate valves must never be used as seacocks. Other desirable seacock attributes include a generous, load-bearing base flange; a non-rusting handle and stem, typically made of bronze or stainless steel; a bonding fastener threaded into the body of the seacock; the absence of brass components; and a winterizing drain plug that allows draining of the ball void when it is in the closed position. If water is trapped in the closed ball and it freezes, it will shatter the valve body. This may not be apparent until the boat is launched in the spring or, if the vessel remained in the water for the winter, after the ice has thawed. Finally, and perhaps most importantly, don’t confuse an inline ball valve with a true seacock. Inline ball valves, which lack a load-distributing flange, are neither appropriate for use as seacocks nor designed by their manufacturers to be used in this manner. They may be UL-approved “valves,” but they are not designated by UL as “sea valves.” In addition to lacking a flange, inline ball valves utilize NPT or tapered threads, while purpose-made seacocks use straight or NPS threads. The latter allow full engagement of the like-threaded through-hull fitting—as many as eight or 10 threads—while the ball valve will engage only two or three of the straight through-hull threads. It’s worth repeating, as this is among the most common seacock installation faux pas I’ve witnessed in my 22 years in the marine industry: inline ball valves are not designed to be used as seacocks.